Elizabeth Cooper can finally do something she has not felt comfortable doing - attend her Glen Este High School reunion. As a Clermont Northeastern High School graduate. “What does this mean to me? I can go to my alma mater, to the reunions now, and say, ‘Hey, I got this.’ I haven’t been to a reunion because I didn’t graduate. 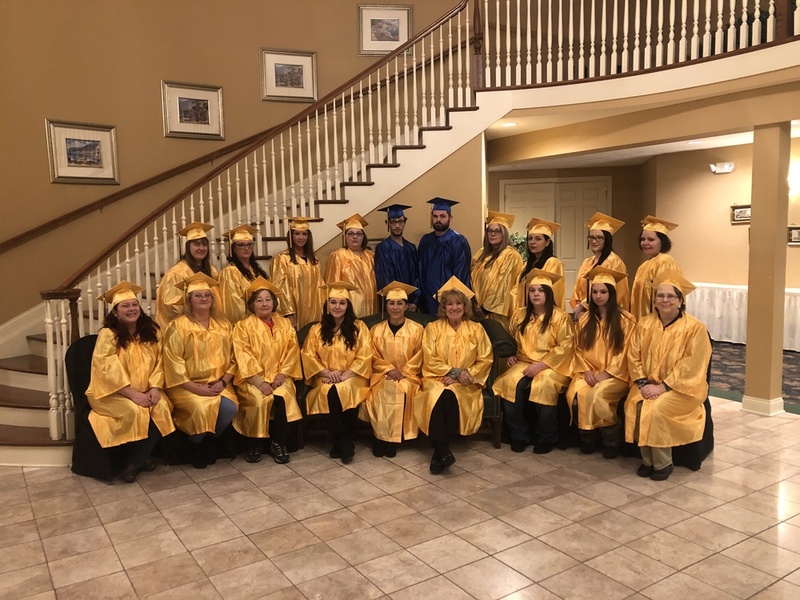 I didn’t know you could still go,” Cooper said, standing in the lobby of the Norlyn Manor in Batavia after receiving her CNE diploma Jan. 22. Cooper is one of 26 members of CNE’s second Adult 22-Plus Class. The program gives adults 22-and-older the chance to complete their high school course of study and earn a diploma. Cooper, 48, left high school, and tried to return, but was discouraged from doing so. A Batavia resident with grown children and grandchildren, Cooper hopes to use her degree in a data entry position. “I want to start living my life,” she said. When Pat Doll’s son graduated from high school, she shared a secret with him. Doll was a student at St. Mary High School in Hyde Park when she had to leave home at the age of 15 to go to work. “I was working two eight-hour-a-day jobs so I couldn’t go to school,” Doll said. She eventually became a team lead at Telfree Communications before retiring 10 years ago. Her husband died a year later. She kept the family’s 27-acre farm near Williamsburg until a year ago, when she sold it and moved to Goshen. Last fall, she read about 77-year-old Rose Riley, another member of the second Adult 22-Plus class, and became inspired. These are the kinds of lives the Adult 22-Plus program, under Havrilla’s guidance, has been changing. “In just one year, 52 individuals have received their high school diplomas. We have awarded over 200 credits and about 44 OGTs have been passed. That’s remarkable for a year in business,” Havrilla said, turning to address the class and wearing a cervical collar. “I can tell you a lot of stories. That’s why this is on,” he joked. CNE Superintendent Michael Brandt was among those praising Havrilla for “his encouragement, his insistence, his persistence … he made 22 phone calls to get somebody who initially signed up but didn’t show up to come, and they’ve now graduated. That shows a commitment to the people within the district of how special Bob is,” Brandt said. Clermont County Educational Service Center Superintendent Jeff Weir was the keynote speaker. His message? “Mostly to applaud the efforts that each of these people made. It’s very easy, I think, for life to carry people away, and in my experiences, I see very worthwhile quality people fall short of earning a diploma in the conventional sense that most of us expect, and then that’s the last you hear of people. You wish them well and hope they’ve landed somewhere to do something productive, but for these people to have made the decision to come back, and to put other things on hold, to compromise and to sacrifice, and to impose on the people they lost most in the world and take the time to do this, and expose their own vulnerabilities, which may have been why they didn’t finish initially, and then to persevere and succeed I think demands attention and applause from the world,” Weir said. “I applaud your persistence, your commitment and your vision,” Weir told the graduates. “Your dedication to working so hard for something that eluded you at some earlier point in your life is a quality that anybody with a lick of sense should appreciate and emulate, As Will Rogers said, ‘Even if you’re on the right track, you’re going to get run over if you just sit there.’ It’s difficulty for a lot of us to do, to get on track and to get moving and frankly more than a lot of folks can handle. Cooper and Doll also singled out Havrilla for keeping them in the program. “I didn’t want to … I was afraid I was going to fail it, and Bob was, ‘No, I want you in here.’ I want to see what you’re doing, because he gave me packets to work with, and the packets alone, I was afraid I screwed them up, and he said, ‘No, go over them with me,’ and he made me go over them with him on the phone and he said, ‘No, you did great. I was afraid to go back in, but he made me go back in, and I’m telling you, everything, in two weeks, I was done,” Cooper said. Doll learned that her best friend knew Havrilla and his wife, which led to a light-hearted exchange after the diplomas were bestowed. “Remember our class motto - ‘You know more than you think you know.’ Always remember that. Live your dream. You’re never too old to extend your life,” Havrilla told the graduates. “Are you pointing at anybody?” Doll asked. “I won’t go into all of the little stories about you,” Havrilla responded. “We’ve got a lot about you, too,” Doll shot back. Adults who did not complete high school or earn a GED, lives in Ohio, and are over 22 years of age are eligible to enroll, regardless of school district. Contact AdultDiploma@cneschools.org or 513-625-1211 Extension 350, with any questions.